A crumpet is circular in shape, roughly 3.5” in diameter and about 3/8' of an inch thick. Their shape comes from being restrained on a flat top griddle by a shallow stainless steel cooking ring. They have a characteristic flat top with many small pores and a chewy and spongy like texture. Not quite a pancake, nor an English muffin they are in a class by themselves. Made from a ‘loose batter’ that is hand whipped and hand poured into custom made rings on a flat top griddle until thoroughly cooked, and then cooled and stored before lastly eaten after being freshly toasted, adding butter, preserves or just about any other topping imaginable. 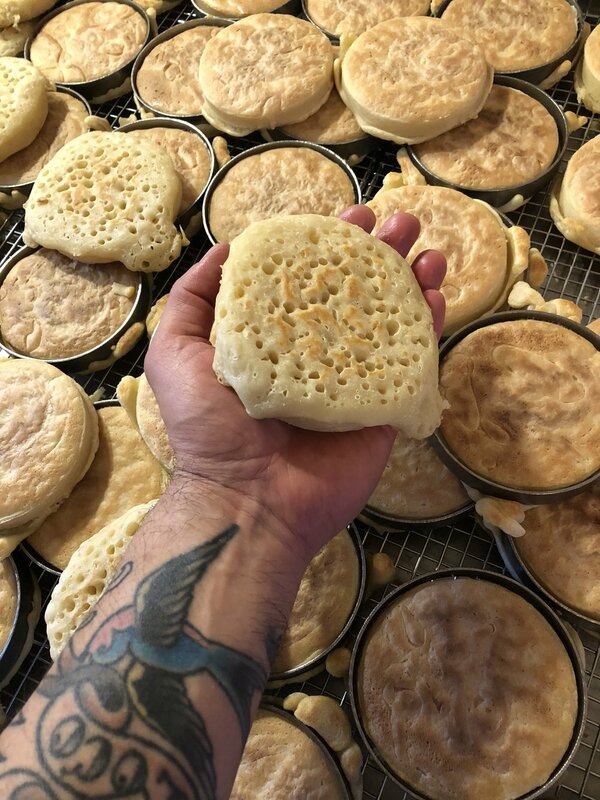 Because a crumpet itself is neither sweet nor savory, it is the topping(s) that defines whether it is a sweet or savory product, therefore a crumpet can be served as either or, it really has no limits! And they sure are delicious! Backside of crumpets, just off the griddle and ready to pop out of the rings.